The disgusting fat acceptance movement. In sub-Saharan Africa being fat is a status symbol. It signifies that you are wealthy due to the fact that you can eat more. The wife of the village chief is usually a porker. All the other women in the village will be railroad thin, although they still tend to have ample bottoms. If they lack even an ample bottom then they’re really poor, as these are people who are genetically inclined to have backsides that curve like the Spa racetrack. Strange. A lot of these fatties are of the same genetic makeup as all those skinnies I saw in Africa. I propose that it is not in fact genetics that cause them to be fat. It is their lifestyle which is at fault and it is abhorrent. It is disgusting. They disgust me in every sense of the word. I am revolted by these walking tubs of lard. They are the diseased, not just of the body but of the mind. You may have heard of the seven deadly sins. Fat people who advocate for fat acceptance encompass a multitude of these sins. Let’s have a look at which ones they slide under. Gluttony. This is an obvious one but gluttony also encompasses selfishness. And activist fatties are pure examples of this. 10/10 score on the gluttony scale. Greed. They also have this one in the bag for they are greedy for food. They are consumed by food and it in turn consumes them. 8/10 for greed. Sloth. About the only exercise these obese wobblers take part in is moving their hand to their slavering mouth. But while physical exercise is obvious here, do not forget that you can be slothful of mind. The terminally obese are the terminally bored. They are apathetic to their state and they exist only to stuff their face while resenting those around them. They are completely lacking in any form of grace and for that reason they score a 10/10 on sloth. Wrath. They hate themselves and thus the hate those around them. They are rigid with hate. They hate so much that the only thing they can do is to attempt to convert others to their awful way of life. The more fatties the better as far as they are concerned. They delight in lumbering down the narrow aisle of a passenger plane and seeing the looks of fear on the faces of the other passengers. They gain turgid joy from the misfortune of others and even more so when they are the cause of the misfortune. 9/10. Lust. Who are we kidding here? 0/10. Envy. Are they secretly envious of all the skinny people that they see? What do you think? This goes hand in hand with wrath. But instead of dealing with their envy they demand acceptance for the diseased of mind and body. 10/10. Pride. Pride is defined as “… dangerously corrupt selfishness, the putting of one’s own desires, urges, wants, and whims before the welfare of people.” This is the granddaddy of the seven deadly sins, the font from which all the others spring. Unable to deal with their personal physical failure, they demand rights based on their slovenliness. Pride betrays their ignorance and the more ignorant they are the more prideful they become. 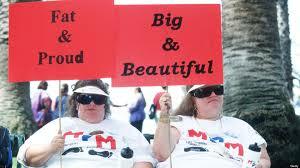 In the group of “fat acceptance” their individual pride morphs together and becomes the group pride. While protesting at the discrimination and prejudice that they face, they betray the discrimination and prejudice that they hold for people who are not fat. 10/10. The human body is a sponge for carbs. It is designed to be a prepper for the next famine. If you have ever assisted with surgery on a heavy person, those giant yellow blobs of adipose clinging to the organs and intestines mean trouble. They ooze a slippery oil that make it difficult to hold onto a tool and get in the way of everything you try to do. Disgusting. Surgeons hate working on heavy people because of that. It pisses them off but they deal with it. Risky, though. But, with the first incision when the yellow subcutaneous globules billow up and flow out onto your skin, they will say things about you that you would not like to hear. It’s one reason they knock you out first. Handling all of that goo in my youth helped motivate me to stay fit in middle age. How anyone can celebrate and promote looking like Britney Spears post-meltdown is beyond me. And anyone who takes these moral cretins seriously is displaying willful ignorance at best. Fat people should be encouraged to become healthy. The fat acceptance movement should be mocked and pilloried out of existence. The habits of the modern man. Um it’s not just women. ALL men are FAT too. Please, I see more men who look like they are in their 3rd trimester than I ever have. 20 year old dudes with guts and love handles?! It’s not just women, its EVERY American, damn never EVERY person in this country is OBESE and if you are fit, get ready for the HATE cuz they pour it on thick. Obesity is a sign of physical, mental and emotional WEAKNESS and if this was 100 years ago they would all be dead. Everyone is only living due to the fact they are on 9 different medications. This whole fat society is repulsive.